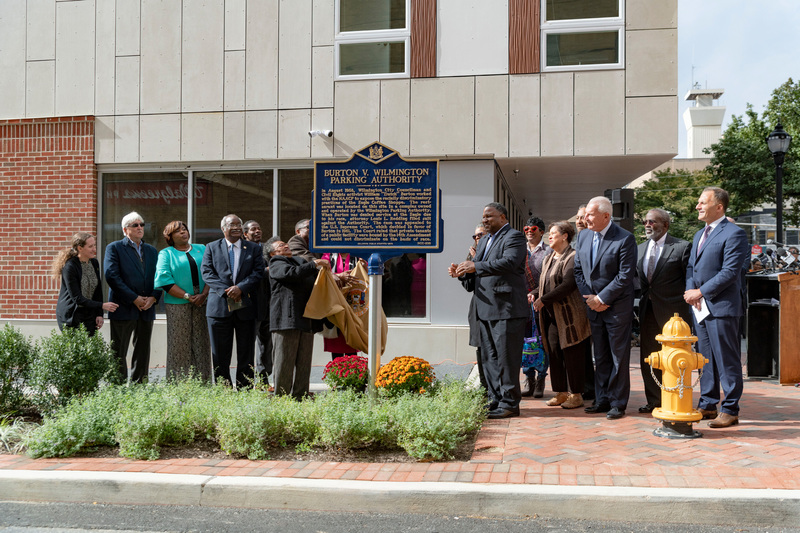 The City of Wilmington, State of Delaware, The Buccini/Pollin Group, Inc. and the Wilmington Parking Authority joined with family and community members on Friday, October 18th to formally recognize and honor the late Wilmington City Council Member and civil rights activist William H. “Dutch” Burton at the site where Mr. Burton became part of local and national history. Burton Place, a new street located within the Residences at Mid-Town Park residential complex on West 9th Street was unveiled as was a state historic marker to commemorate the landmark court decision Burton v. Wilmington Parking Authority which eventually led to the abolishment of Delaware’s discriminatory accommodation laws. In the late 1950’s, near the site of the event, then City Council Member Burton parked his vehicle at the former Mid-Town Parking Center owned by the Wilmington Parking Authority (WPA) and walked to the nearby Eagle Coffee Shoppe which leased space from the WPA, a quasi-government agency established by the State of Delaware in 1951 to encourage greater parking access for downtown businesses. Burton was refused service at the coffee shop explicitly because he was African American. Louis L. Redding, a local civil rights attorney who helped litigate Brown v. Board of Education, became involved in the dispute which eventually ended up before the U.S. Supreme Court which ruled that private tenants of a public facility were bound by the 14th Amendment and could not discriminate on the basis of race. The event included remarks by Wilmington Mayor Michael Purzycki, City Council Members Nnamdi O. Chukwuocha and Samuel L. Guy, State Representative Stephanie T. Bolden, Retired Superior Court Judge Charles H. Toliver IV, Director of Delaware Public Archives Stephen M. Marz, CA. and Executive Vice President of The Buccini/Pollin Group, Michael Hare. It was Council Member Guy who in 1998, and again in 2017, sponsored Council Resolutions that were approved by his colleagues seeking to have the WPA join in honoring William H. “Dutch” Burton and to forever remember the significance of Mr. Burton’s actions to end discrimination.